10 medaglie d'oro in Incold! 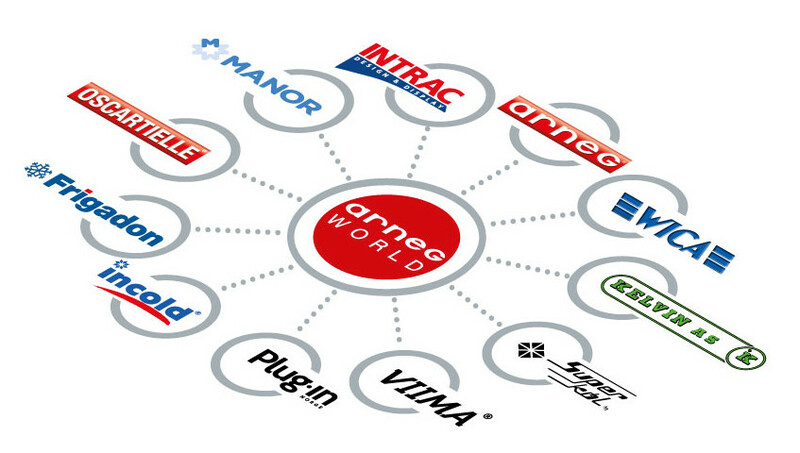 Incold S.p.A. meets Arneg Sister Companies to share product and process news. This Website is owned by Incold S.p.A., with registered office at Via Grandi, 1 45100 ROVIGO Italy, company capital € 13.020.000,00, Tax Code, VAT number and Padua Chamber of Commerce registration number IT 01166700292 (“Incold”). These General Conditions of Use ("General Conditions") govern the navigation and use of the various functions enabled in the public and restricted areas (“Public Area” and "Restricted Area" respectively) of the Website www.Incold.it (the "Website") by subjects accessing the Website ("Users"). 1.2 The Restricted Area is divided into areas with different levels of confidentiality. Access, in whole or in part, to such areas is granted only to Users whose registration has been accepted by Incold. The Restricted Area allows Users to benefit from commercial, technical, and updating services (the "Services") and to access information, data, links, software, music, sounds, photographs, images, videos, messages and all other materials made available by Incold (the "Content"). 2.2 On registration, Users must choose a user name and a password ("ID" and "Password" respectively) and must provide a valid, current and verifiable e-mail address. The co-existence of identical IDs and/or e-mail addresses is not permitted. If Users enter an ID and/or address that is already used, they shall be invited to choose an alternative. Users must also indicate a contact person within Incold who can confirm their identity and their relationship with the Company. 2.3 Incold will send Users an e-mail confirming their registration details. Incold reserves the right to refuse a User's registration for all or some of the Services and/or Contents, at its own discretion. Registered Users are required to keep all the data they enter up to date, accurate and current. 2.4 Incold reserves the right to change the ID of a User, delete content sent to the Website, and refuse or cancel a User's registration, should that User choose an ID which, at Incold’s sole discretion, is judged to be obscene, indecent, vulgar or otherwise improper. 2.5 Registration for the Website and User accounts created by registration remain valid for twelve (12) months. Users will be notified by e-mail 2 (two) weeks in advance of the expiry of their registration. Users are responsible for renewing their registration by submitting a request to their contact person within Incold. 2.7 Users assume full responsibility for limiting access to their own computer/s by third parties, and for protecting their login credentials against unauthorised use. Users likewise assume full responsibility for all activities conducted through their accounts, IDs and/or passwords, whether attributable to their own actions, inaction or negligence. If Users become aware of suspicious or unauthorised use of their accounts, IDs and/or passwords, they must inform Incold promptly by e-mail. 3.2 Users expressly undertake not to reproduce, modify, duplicate, copy, distribute, sell or otherwise transfer Content and/or Services to third parties nor to exploit them for purposes other than those described in these General Conditions without prior written permission from Incold. In particular, Users acknowledge the confidential nature of the Content and the Services provided in the Restricted Area and therefore expressly agree to respect that confidentiality and not to disclose Content or Services to third parties in any way. Registered Users must also transfer this obligation of confidentiality to their collaborators and employees. 3.3 Users undertake to use the Website, its Services and Content, and all other data and/or information contained therein, exclusively for lawful purposes, in accordance with these General Conditions and with the provisions of applicable law. Users therefore guarantee Incold complete indemnity and accept full responsibility for any and all unlawful misuse and/or violation of applicable laws. 4.1 The "Incold" name and logo is a registered trademark of Incold S.p.A. (the "Trademark"). The graphical representations, drawings, technical drawings, designs and Content of this Website and its collection and organisation in general are protected by copyright and the exclusive property of Incold S.p.A..
4.2 Access to the Website does not grant Users the right to use the Trademark, name, logo or brand associated with the Services and/or Content of the Website. The display, downloading and printing of the Trademark and Content is permitted solely for purposes related to use of the Website. It is forbidden to copy, reproduce, distribute, publish, download, display, send by electronic or mechanical means, transmit, record, duplicate, photocopy or reproduce the Trademark or Content in any form without the prior written consent of Incold. 5.1 To the extent permitted by applicable law, Users accept that they use the Website at their own risk. The Website is provided "as is" and "as available". Incold offers no specific warranty as to the results that can be expected, desired or obtained through use of the Website, its Services and/or its Content. 5.2 Pursuant to article 1229 of the Italian Civil Code, Users agree and promise to indemnify and hold harmless Incold, its representatives, employees, contractors, associates and partners from all liability, including legal fees, incurred in connection with use of the Website. 5.3 Incold declines all liability for claims made by Users concerning the impossibility to use the Website and/or its Services or to access the Contents or Restricted Area for any reason whatsoever. 5.4 Incold reserves the right to disconnect, remove and/or replace Services and Content (or any part thereof), temporarily or permanently, and at any time. Users accept that Incold cannot be held responsible in any way to them or to any third party for any suspension and/or interruption. 5.5 Information (in text or graphic form) provided directly by Incold's suppliers and related to goods and/or services offered on the Website does not imply any liability on the part of Incold. The parties providing such information assume full and exclusive responsibility for the instructions, specifications and descriptions contained therein. Incold cannot therefore be held responsible for graphic inaccuracies and/or errors. Incold offers no warranty, implicit and/or explicit, regarding details, content or software, or the merchantability and fitness for purpose of information, goods or services described or offered by suppliers through the Website. Incold nevertheless declares that, upon request and within the limits of the law, it shall provide the names, addresses and other details necessary to identify the supplier and/or manufacturer of goods and services offered. 5.6 Incold has compiled the information provided on the Website from internal and external sources and to the best of its knowledge and belief, using professional diligence. No representation is made nor warranty given, either expressly or tacitly, as to the completeness or correctness of the information contained in the Website. 5.7 Incold, the companies in the Incold Group and its affiliates, partners, licensors and suppliers assume no responsibility for any interruptions or omissions affecting the Internet, the network or hosting services provided, and offer no warranty that the Website, the Services and/or the Content contained therein nor electronic communications transmitted by Incold are free from viruses or other harmful elements. 6.1 The Website contains links to other websites or other Internet resources ("Links"). The User acknowledges and accepts that Incold cannot be held liable in any way for the proper functioning of such external resources. 6.2 Incold is not obliged to monitor the content of external resources or sites accessed via links and therefore assumes no responsibility for the content and/or material, advertising included, contained in such external sites or resources or for the products or services offered therein. 7.1 Incold offers no warranty that the information contained in the Website (and in particular the Services and Content) are correct and legal outside Italy. 8.1 In conformity to articles 13 and 14 of EU Regulation 2016/679 (General Data Protection Regulation) and Italian data protection legislation (Legislative Decree 196/03), Incold informs Users that it processes the personal data necessary to identify individuals (e.g. name, surname, tax code, VAT no., e-mail, telephone no., etc. – hereafter “Personal Data”). Incold assures Users that their Personal Data will be processed according to the principles of correctness, legality, transparency, confidentiality and respect for Users' rights. The Controller is Incold S.p.A., with registered office at Via Grandi, 1 45100 ROVIGO Italy. Only with Users' previous and specific consent, Incold may also process their Personal Data to distribute commercial newsletters and promotional material concerning products, to carry out market research or other sample-based research, to monitor levels of customer satisfaction and to distribute material concerning Incold events and initiatives. Personal Data may be processed by persons working as data processors inside or outside Incold. Users' Personal Data will be kept for the duration of their relationship with Incold and for the time necessary to fulfil the purposes described above but for no longer than 10 years after the conclusion of the relationship. Users may exercise their rights by writing to Incold at the following email address policy@incold.it. 10.1 Incold reserves the right to make changes to this Website, its Services and Content and to these General Conditions at any time. Users should always refer to the text of these General Conditions of Use as posted on the Website at the time of consultation. 10.2 These General Conditions and the relationship between Users and Incold are interpreted and governed by Italian law. 10.3 Any dispute arising between Users and Incold concerning or related in any way to the interpretation and execution of these General Conditions, or to use of the Website, its Services and/or Content shall be decided exclusively by the courts of Padua, Italy. 10.4 Incold's decision not to exercise any of the rights and provisions set out in these General Conditions may not be construed as a waiver of the same.